I met my scrapbooking online buddy of 4 years in real life for the first time this summer when I headed to LA. We are both scrapbookers so we need to have our pages of this meeting be extra beautiful and this line fits perfect since we went to santa monica pier with the fair on it!! Congrats, Val!!! Please shoot me an email with your address so I can pass it along to October Afternoon. October Afternoon - Midway Blog Hop & a Giveaway! Hi everyone and welcome to the October Afternoon Midway blog hop! 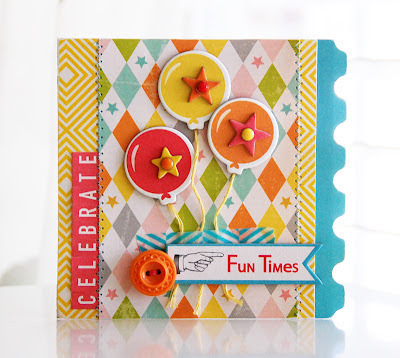 Several of the design team members have put together some fun projects using the new Midway collection. The colors are so bright and the images are so fun... I know you all are going to love it! Let's get started! I created this card using several of my favorite pieces from Midway: patterned paper, chipboard, miscellany, letter stickers, a chapter book page, washi tape, and brads. Just a fun mix of everything! 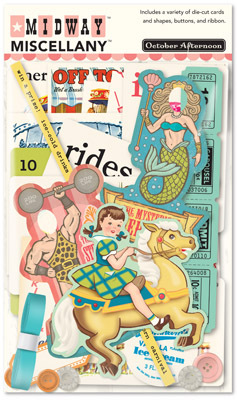 Today, during the hop, I'm giving away a package of Midway Miscellany. All you have to do is leave a comment here on my blog by Sunday, September 16th, at midnight CST, let me know how you see yourself using this gorgeous collection of Miscellany, and I'll draw one lucky winner to receive it. And don't forget to make your way all the way back to the OA blog where the Grand Prize is being given away - a whole Midway Collection Kit! You won't want to miss that! 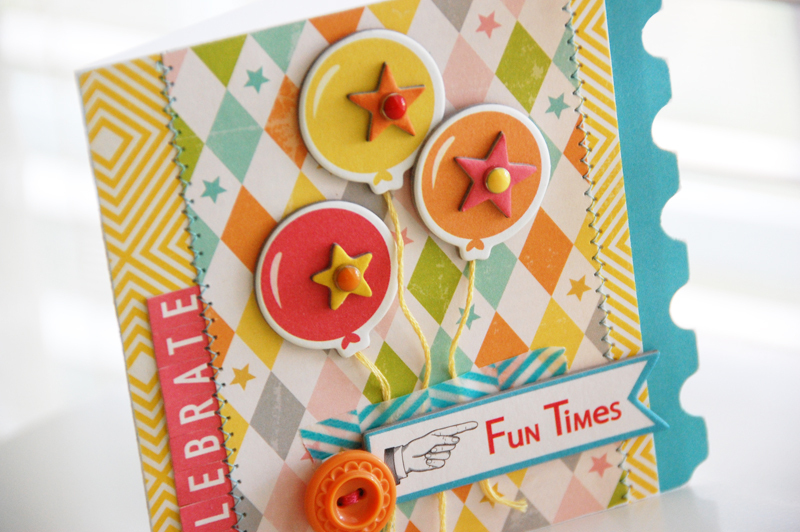 Now it's on to Mou's blog to see the gorgeous project that she's created with Midway! And if you get lost along the way, here's the list of everyone on the hop. Winners will be announced later next week! Good luck, and thanks so much for stopping by!